Email newsletter subscribers read word-for-word just 19% of the e-zines they receive, according to the Nielsen Norman Group’s latest eyetracking study. Pass the squint test Squint at your newsletter. Can you see the parts? Image from iStock. They skim — or even just glance at — email newsletters 75% of the time. So how can you write an email that’s easy to skim? Pass the squint test: Squint at your newsletter. Can you see the parts? Show the parts It’s easy to see the parts of this issue of Wylie’s Writing Tips. Does your email newsletter pass the squint test? Break copy up and draw readers in with formatting. 3. Put your messages where readers’ eyes are. Headlines. If they could get the gist of the e-zine from the headlines, they were happy with the newsletter. First 1-2 lines of text. Get to the point faster in email. Bulleted lists. Subscribers read the first item more than subsequent and the first words in each bullet more than subsequent. Links. But not generic links. Get opened, read and clicked through Learn more best practices for writing email newsletters, invites and e-blasts that get the word out. 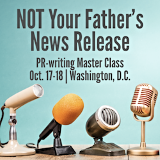 Join me at Inside the Inbox, our email-writing workshop, on Nov. 7-8 in D.C.